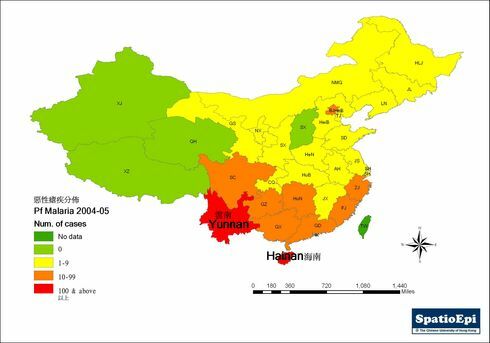 The map shows the distribution of Plasmodium falciparun (Pf) malaria in China at the province level. Pf is one form of plasmodium infection which often presents with a feverish disease, the severe form of which can be fatal. The average number of reported Pf cases for the year 2004/2005 is presented in the map. Evidently the total number of known cases of malaria is very low across the country. The disease is largely limited to Yunnan and Hainan Provinces, which contain the most seriously affected areas. In other parts of the country, including Hong Kong, isolated cases of malaria are reported, which are normally imported. Data for the map were obtained from CDC China. Malaria is caused by a parasite called plasmodium, which is transmitted via the bites of infected anopheles mosquitoes. Plasmodium is a single-celled protozoan parasite with a larger size than bacteria. It is widespread in tropical and subtropical regions. Each year, there are approximately 350-500 million cases of malaria, killing between one and three million people worldwide. Four types of the plasmodium parasite can infect humans; the most serious forms of the disease are caused by Plasmodium falciparum (Pf). The main means of malaria control include the use of insecticidal nets, treatment intervention, and mosquito control.